About life, love, friendship, fatherhood, & growing up without ever growing old. I’m still not sure where we went wrong as children, but if we had a moral compass we probably stole it. Maybe it was because we were dirt poor. Maybe it’s that we were bitter about growing up without a father in our house on a daily basis. Or maybe it was just because we liked to do things our own way and we didn’t like authority figures — not teachers, principals, cops and least of all nosy neighbors — telling us what we could and could not do. Our early life of defiance blossomed sometime after we began losing some of our once undying enthusiasm for playing competitive sports. Oh, we kept playing baseball, basketball, street hockey, and football. But gradually the unbridled joy from these activities was no longer enough for us. For some inexplicable reason that nearly all boys in our generation seemed to experience at some level, we suddenly saw it as our duty to break society’s rules on a pretty regular basis. Like a lot of boys, we went through a kleptomania phase. I’m ashamed to admit this now, but we had an incredible knack for purloining all sorts of things without getting caught. And I’m not just talking about candy bars and baseball cards and small items. A willow tree that once adorned the side of the town’s public library somehow suddenly took root in our backyard. We stole stop signs, construction horses and other things that would be seemingly hard to take without someone noticing. 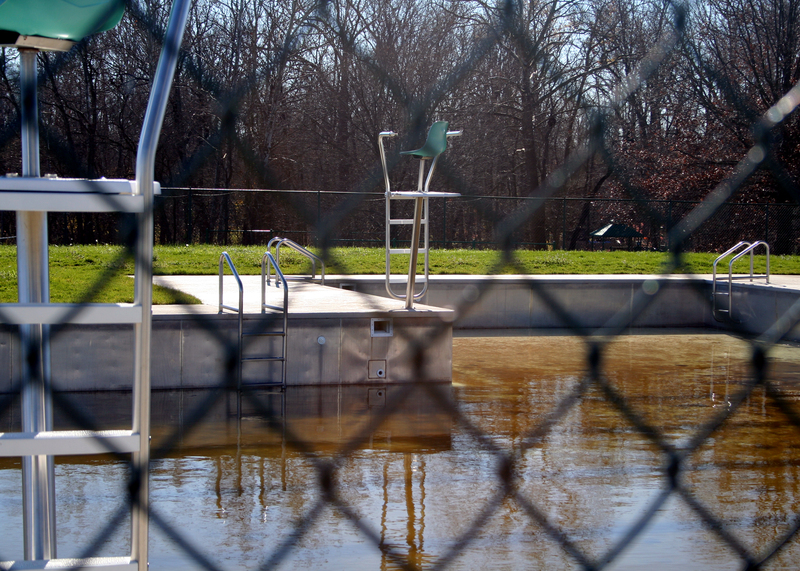 We had an endless array of towels we lifted from the park district swimming pool that we visited daily in the summer. We had an affinity for any towel that was unusual. We had a Budweiser towel, a Cracker Jack towel, a 7-Up towel, a rebel flag towel (we never liked what the rebel flag stood for, so we wanted this out of circulation), a Coca-Cola towel — you name it. Our trip to the pool always began the same way. We’d ride our bikes there without a towel. Then we’d bring at least one home every day. It got so ridiculous at one point that I saw my Mom trying to place some freshly laundered and folded towels into the linen closet and there was no room for them. “Where are all these towels coming from?” my Mom would ask. “Beats me,” we’d say. Our reputation for towel theft grew to legendary proportions. In fact, many years after we had stolen our last towel a guy came up to me in my junior year of high school and told me how he knew for a fact that I stole his rebel flag towel. I just smirked and said I had no idea what he was talking about. He grew steadily more agitated as I danced around responding to his accusation. He actually wanted to fight over this, but I finally talked him off his emotional ledge. While at the pool, we also perfected the art of what we called “kicking towels.” As we almost never had pocket money due to poor finances on the home front, we knew that many kids who were more well off than we were would bring some change with them to get something to eat when they were done swimming. But instead of safely putting their coins in their basket of clothes where we couldn’t get at them, they would put the money under their towels. So as we were walking from the pool to the sun deck to pick up a towel that wasn’t ours, we’d kick some towels along the way and see if any money came loose. Inevitably we’d net enough lucre for something to eat after a long afternoon swimming. The lifeguards eventually caught on to us and they began to watch us closely whether we were on the deck or horsing around in the water. As soon as they saw us breaking any of their growing list of rules they’d blow their whistles as loud as they could at us and tell us we had to sit next to them for 15 or 30 minutes. This would continue for a couple of rounds before they’d tell us we were kicked out for the day. “No problem,” we’d respond, “we’ll be back tonight.” The lifeguards would always say, “No, you’re kicked out for tonight too.” And we’d respond, “No, we’ll be back tonight.” And we meant it. We’d come back after the 9 pm closing time, climb the barbed wire fence and have the run of the pool and the lifeguards’ office for the evening. The police would often show up, shining spotlights on the water to try to catch us. We’d either duck under the water or hide out in the lifeguards’ office making crank calls on their telephone. We even once placed a long distance call to a friend who had moved to Colorado. Our petty larceny got so bad we started to think of ourselves as the junior mafia. One of our good friends, Doug Miller, used to break into this hilarious routine around our parents vaguely alluding to our syndicate. For instance, if my mom was saying how angry she was because one of the neighbors was giving her a hard time or accusing us kids of things we did or didn’t do, Doug would adopt this Bob Newhart-like persona to discuss how our junior mafia might need to address this situation. Doug would quietly reach into his pocket for an imaginary dime, put it into an imaginary pay phone, dial an imaginary number and start making sound effects like the phone is ringing. “Hello mafia,” he’d deadpan. “Yeah, can you take care of Mrs. Erbe?” or some source of our consternation. Then he’d break into more sound effects, including one of a gangster with loud heels clicking on the sidewalk on the way to rub out someone. Every time Doug did this we’d scream with laughter, knowing that it was foreshadowing what we were going to do later to take matters into our own hands. Our parents always reacted the same way to Doug’s theater of the absurd. “Oh, he’s so funny,” they’d say, oblivious to the fact that neither Doug nor we were joking. The mafia paid more than a few visits to neighbors who did things like take our footballs or baseballs away as a means to get us to stop playing in the street or who called or stopped by one of our homes to blame us for anything that happened to their lawn or property. These were usually fairly harmless responses on our part, but we placed a premium on getting victim as angry as possible. After one neighbor, Mr. Hanson, stole our football mid-game because it rolled onto his lawn, the mafia took note and promised to pay him a visit. Every night until we got that ball back. And until we got that ball, we were going to keep disturbing his dinner and/or sleep. Each night the routine was the same. John and I and other wiseguys rang Mr. Hanson’s doorbell at dinnertime or much later and ran away just far enough so he could still hear us snickering. This went on for more than a week. Now, the Hanson’s front porch was fronted by some hedges and his backyard was lined with a perfectly symmetrical, always pristine white picket fence. So after we rang his doorbell, we’d leap over the hedges, run over to the side of the house, vault over the picket fence and into Mr. Hanson’s backyard (just to prove he couldn’t keep us off his property) and then over the back fence to the next block. After carrying out this raid for one too many nights, the young and pretty athletic Mr. Hanson was waiting for us. We had just depressed the button on the doorbell when we heard the front door come flying open and the screen door pushed open right behind it. We leaped over the hedges with the spry Mr. Hanson in hot pursuit. He cleared the hedges and was hot on our heels. Suddenly, we were almost in arm’s reach when we flew over his picket fence. Mr. Hanson wasn’t so lucky. All we heard was an excruciating scream. We looked back to see the football thief writhing around his weed-free yard in great pain. We stopped for a quick laugh before dispersing. We thought this was over until several days later when we were milling around the street and Mr. Hanson snuck up from behind and grabbed John by the neck. We all stuck around just in case he did anything violent. “You see this,” Hanson was shouting as he pointed to one of his calves that had a striking purple gash to it. “You did this, you little bastards.” I can’t remember exactly how the exchange ended but there was no real damage done. Except to Mr. Hanson’s swollen leg, which now had many bulging and bruised veins that bore a striking resemblance in color to a Rand McNally map. About this time, the mafia entered into a new racket, one that paid off in more than just laughs. Back then, you could turn in glass pop bottles to grocery stores for a refund. An 8-pack of empty bottles would get you something like 25 cents. At first we tried to do this the legit way by knocking on doors and asking people if we could cart their empty bottles from their garage. Some people would say yes but this was a lot of effort and we still had to haul the bottles a mile or so to the store. Then one day, John and some of us came up with a better system. While we were at the Jewel turning in a few bottles for change, we noticed the girl behind the counter was loading them onto a wooden pallet. Just then a stock boy came by with a cart, picked up the pallet and wheeled the cases of bottles toward the back of the store. We followed him until he went through a set of doors marked “employees only.” It appeared he was heading to the rear parking lot, so we ran out the front entrance and around to the back of the building to see where he was bringing the bottles. And there it was — our cash cow for a couple of summers — stacks and stacks of empty cases of pop bottles. Not wasting any time, we sprinted to the front of the store and grabbed a couple of shopping carts, loaded them over the top with the empty bottles and walked proudly in the front door to claim our deposit money. It worked every time. Like clockwork, the store employees would take the bottles out back, we’d pick them up and bring them right back in the front door. It seemed like this would never end. That is, until one day when John and I headed behind the store and found a construction crew working where the bottles were normally placed. They were laying bricks for an enclosure to house the bottles. I never saw John so sad. Our thieving ways continued for a number of years until we eventually went straight. This was a gradual phasing out of our larcenous times and one of our last heists happened to also be one of the smallest. Late one night my Mom had taken me and my two brothers and sister to a huge local nursery to buy some Christmas decorations. While she was shopping in this vast barn and gift shop, my two brothers and I found three tiny glass reindeer that looked just like the characters in that Rudolph the Red Nose Reindeer TV show with Burl Ives’ narrating. Without really talking about it, we just looked at each other placed a five-finger discount on one reindeer apiece. Once in the car and on the way home, we started to giggle about our haul. My Mom knew something was up and she knew it wasn’t good. By the time we got into the house, we ratted ourselves out. She was furious. But because it was so late and the nursery was likely closed for the night, she said she’d wait until morning to drive us back there to return the items and apologize profusely to the nursery’s owner. We were dreading the arrival of the next morning and having to face the nursery owner. This truly made us see the error of our ways. Until, that is, John and Jerry came barreling into the house bright and early the next morning triumphantly carrying in that morning’s Daily Herald over their heads with one hand each on the newspaper and wide smiles on their faces. It reminded me of one of those black-and-white photos you saw of New York Giants fans from 1951 the morning after Bobby Thomson hit the game-winning homer off the Yankees to win the pennant. It was as if they were carrying the newspapers over their heads to prove that this was real. 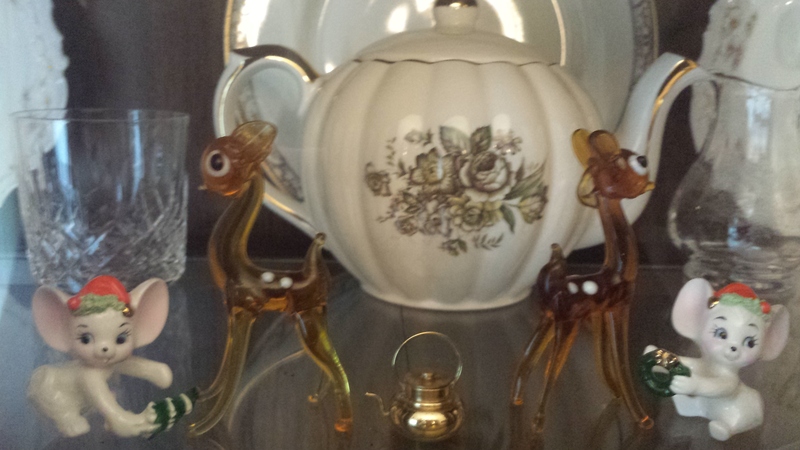 2 of the actual, infamous glass reindeer figurines “saved” from the nursery fire by the Kehoe boys. My still seething mother suddenly gave up the good parental fight. Even she had to laugh at the twisted logic.